The good news is that we finally got away for a camping vacation last week. The bad news is that we came home early due to an impending storm & then super-cold temps predicted afterward. That's 4 camping vacation cancellations/postponements/early leavings since July! We have spent more in lost reservations and cancellation fees this year than in actual camping. But, we made the best of things and enjoyed two more days of staycation at home. Very foggy when we arrived at Locust Lake SP on Monday! Lots of bridges, thanks to local Eagle scouts! All that rain left lots of salamanders, like this Red Eft. Treetops were still mostly green but a pretty carpet of leaves on the ground. Locust Lake's resident Bald Eagle. I'm happy that the sun finally came out! Mid-week fall camping means mostly empty campgrounds! Sun came out just in time for a gorgeous sunset on the perfectly still lake. Sunshine on Wed! Tuscarora Lake through the trees. Walking over the dam at Tuscarora Lake with the mountains in front. View of Tuscarora Lake from the top of the dam. I am happy to finally have some fall weather now at home (though it seems that we are jumping right from 80's to 50's). Hope you are enjoying a great weekend! Lovely photos of two beautiful parks. I'd love to hike and camp in both places. Your picture of the perfectly still lake is one of the best reflection photos I've seen. Even though you had to leave earlier than you'd hoped, it looks like you made the most of your time in both places. 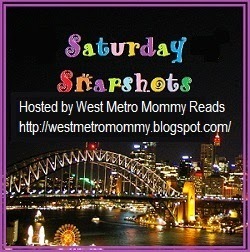 My Saturday Snapshot post features sculpture. Thanks, Sandra - it was cloudy much of the time we were there but the sun came out just in time for that perfect reflection shot at sunset! Your camping posts always make me long for the time and freedom to go camping again. Hurrah for empty campgrounds. Seeing an eagle is always special. We enjoy it so much, Jane! Just being outdoors is so rejuvenating & peaceful. Hope you can manage it sometime soon!